The current political discourse before and after the heated 2016 electoral year has been gravitating around some simple, commonsensical yet grandiose ideas like: making America great again; reviving trade; recapturing the outsourced jobs from nations that benefited from globalization; and strengthening the military, weakened by demagogue politicians. At present, American manufactured products are less competitive in the international markets, while the American military is, allegedly, incapable to successfully fight a two-front war anymore. In the meantime, America’s traditional foes in the international arena have been vigorously recontouring their territorial expansion policies. Russia is extending her sphere of influence both in the Arctic and the Pacific Rim. China is pushing its boundaries in the disputed area of the South China Sea, while North Korea has stated that it is ready to launch a nuclear attack against the United States. In addition, rogue nations, like Iran and Venezuela, display bombastic narratives about regional dominance, while international terrorism continues to expand. Accordingly, the United States have to sharpen their narrative about a new era of American greatness and exceptionalism. It’s not about “the world’s policeman” or “nation building” anymore, but about how America can recapture her greatness for herself, not so much for the world. In doing so, we need to remember the past periods when America was, indeed, great(er). Let us recap succinctly some of those. 1. The Spanish-American War of 1898: the U.S. sovereignty over Cuba, Puerto Rico (in the Atlantic/the Caribbean Sea), Guam and the Philippines (in the Pacific), and soon after that, over the Panama Canal (in 1903). 2. During the years of the World War 1 (the U.S. entered the war in 1917): the U.S. administration of Haiti (1915), Dominican Republic (1916), Virgin Islands (purchased from Denmark in 1917), and Rhineland/Germany (1918). 3. During and after the World War 2: the U.S. occupation of Iceland and Greenland (1941), parts of Austria and Germany, including West Berlin (1945), Japan and South Korea (1945), Trieste/Italy (1947), and the administration of the Trust Territory of the Pacific Islands/West Pacific Micronesia (1947). On the other hand, the United States have a long lasting tradition of turning their territories and possessions into states, when imperatives of the times have required them to do so. To begin with, most U.S. states, except the original 13, were territories before they became states. The last U.S. statehood-granted territories were: Oklahoma (in 1907), New Mexico and Arizona (both in 1912), Hawaii and Alaska (both in 1959). Currently, there are 16 U.S. territories, five of which are permanently inhabited: American Samoa (AS), Guam (GU), Northern Mariana Islands (MP), Puerto Rico (PR), and U.S. Virgin Islands (VI). The rest of the 11 territories are small islands, atolls, and reefs spread across the Pacific Ocean and the Caribbean Sea, with no permanent population. Also, there are certain constitutional and administrative differences between these territories. Some territories are or are not incorporated (as part of the United States proper), and do or do not have an organized government (that is, through an organic act passed by the U.S. Congress). Thus, there were incorporated organized territories of the U.S. (such as Alaska and Hawaii until 1959). 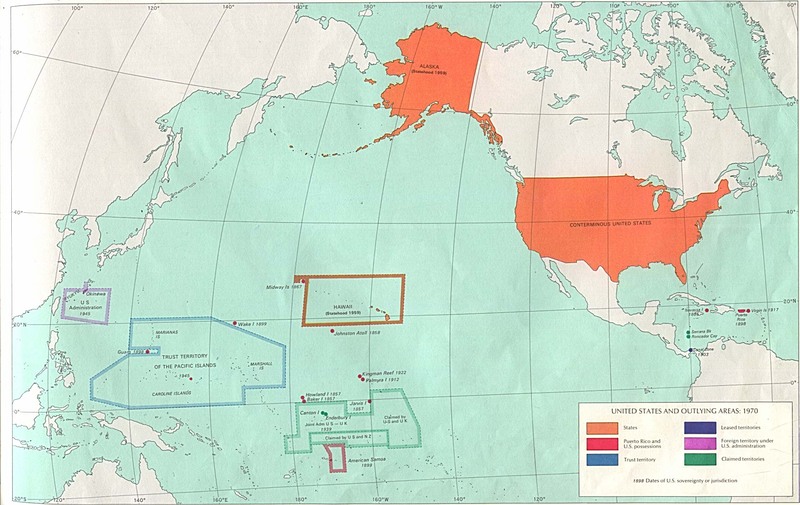 Currently, there are only U.S. territories that are incorporated unorganized (Palmyra Atoll), unincorporated organized (Guam and the U.S. Virgin Islands), unincorporated unorganized (American Samoa and other islands, atolls and reefs in the Pacific Ocean and the Caribbean Sea), and commonwealths (Northern Mariana Islands and Puerto Rico). Other former U.S. territories have become independent countries, such as Cuba, and the Philippines, or U.S. associated states, like the Federated States of Micronesia, Marshall Islands, and Republic of Palau. It should be mentioned the fact that, with the exception of Cuba (former territory) and the Philippines (former commonwealth), the other three former U.S. territories, currently associated states, gained their independence under the Compact of Free Association (COFA), which allows the United States to have full authority over aid, defense, health care, and other government services (such as federal communications and postal service), plus the right to work in the U.S. and vice versa. Despite the various local organizational differences among these entities, the common denominator is that they all are (or, in the case of a few others, used to be) U.S. territories. For the aforementioned obvious reasons (strategic, military, and economic), we need a new approach, serious and uninhibited, to grant the U.S. statehood for at least five territories: American Samoa, Guam, Northern Mariana Islands, Puerto Rico and U.S. Virgin Islands. A further step may include attracting the current COFA entities – the Federated States of Micronesia (FM), Marshall Islands (MH), and Republic of Palau (PW) – into the new federal construction. The process of granting statehood to territories follows the procedure stipulated by Article IV, Section 3, Clause 1 of the United States Constitution. Puerto Rico held several statehood referenda (the last one in 2017), but the attempts were unsuccessful. Some critics object to the idea of admitting new members in the Union for various reasons: small territory and scarce population; possible reversal of the power control in the U.S. Congress; and the huge debt of some territories. Possible solutions may include: reuniting two or more territories into larger states (e.g., Pacific Islands, Caribbean Islands); adjusting some seats in the Congress between the existing and the newly admitted states; and making bipartisan deals for the debt issues, case by case. An inspirational movement, which we call STATEHOOD FOR THE U.S. TERRITORIES, coming from the top executive level (the President), in conjunction with its top legislative counterpart (the Congress), is expected in order to gather and channel the grassroots energies and resources toward this noble and visionary ideal. NOTE – A version of the article was published previously in PUERTO RICO MONITOR. Tiberiu Dianu has published several books and a host of articles in law, politics, and post-communist societies. He currently lives and works in Washington, DC, and can be followed on MEDIUM. President Trump has promised he would make America great again. The article introduces a project to fulfill this dream. Some of the objectives are: recovering the outsourced jobs; improving foreign trade; strengthening the military to protect the country, given the recent military actions of countries like Russia, China and North Korea; and economic sanctions from countries like Venezuela. Terrorism has extended and the nation has to defend itself. The article describe in a succinct but powerful manner the periods of time when America used to be much stronger and larger, as a model for the current measures, and incentive for fulfilling this dream. The main idea of the article is that the territory statehood should come from the President and U.S. Congress. This project will channel the basic resources toward a noble goal, which is to make America great again. Of course, there will be hurdles, since this phenomenon will trigger changes on the balance of power. But victory comes with struggle, and this original idea should be materialized for the good of the country. This article is a sharp reminder of the American History. An extended America is not colonialism.